Melania Trump wraps up a four-country tour with a visit to the pyramids and the Great Sphinx in Egypt. 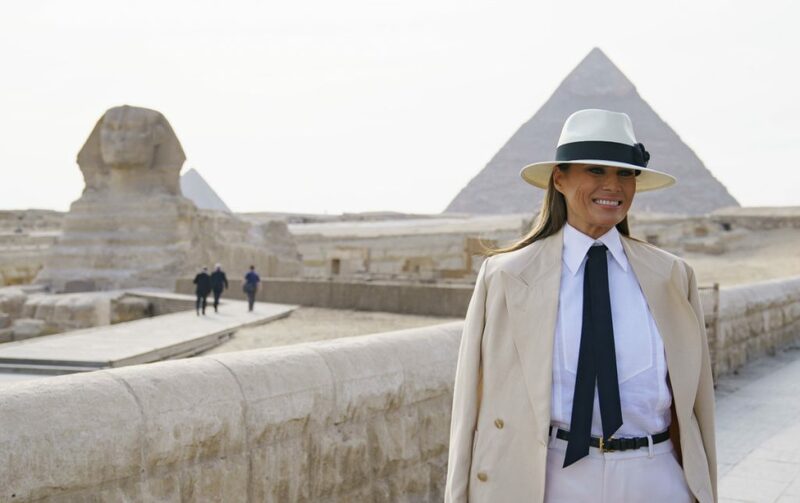 First lady Melania Trump visits the ancient statue of the Sphinx at the historic site of the pyramids in Giza, Egypt, on Saturday. The first lady spoke briefly with reporters Saturday as she was wrapping up a four-country tour of Africa with a visit to the pyramids and the Great Sphinx in Egypt. Mrs. Trump’s outfit choices have drawn attention, as when she wore a jacket that read “I REALLY DON’T CARE, DO U?” during a trip to visit migrant children.